Back in June I was playing in EQ and came up with this design with hexagons that’s mean to use a charm pack! As you may know, English Paper piecing takes a long time, but for this it didn’t take THAT long as it was a small project. Here is the top all done and with a black border. 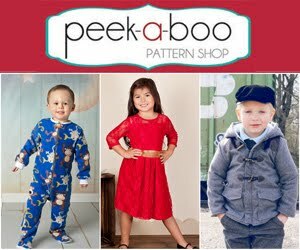 Have any of you tried these threads? 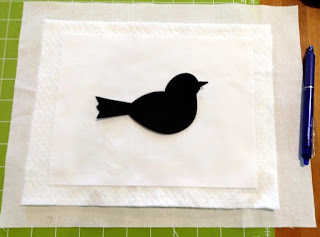 I had an idea about a black bird on white with silver thread tree branches. 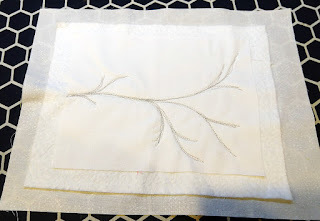 and with the silver Coats thread on top and white on the bobbin I free motion stitched the branches, I went back and forth several times to see if I wanted it thicker or not and the sloppier the better! It was a tiny bit bunched up when I was done so I should have used a stabilizer on the back, but lesson learned and for such a small piece and with a big bird on top it would be fine, and after pressing with a hot iron it helped a lot too! Then I stitched down the bird in black thread, again with a sloppy double or triple line and then I added a grey binding, just because I felt like it. Notice how the bird is NOT centered!? I deliberately tried NOT to have it centered, because THEY say that a focal point should be a third up or down on the picture, and diagonal lines are great too. well now the birdie is hanging over the thermostat upstairs near the kids’ rooms, I guess it’s checking that the temperature is right?! Thanks to Carla for hosting a great swap! Both cute projects. I really love that little bird. Small projects make for quick satisfaction, both are very cute. Love that new thread. Both your projects are really great! I love EPP and seem to do it with hexagons mostly. Your bird project is so pretty. Very cute projects, black and white is so striking together! Nice work. Maybe small projects in size but there’s a lot of detail in both. And I do love the thread. Both projects are great. 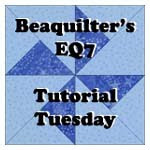 You can cut cardstock with the Accuquilt?? Two wonderful quilts - but I must ask how do you get so much done? You are amazing. I saw one very similar to that bird at the museum yesterday; this felt serendiptious. English paper piecing was my first love when I started quilting. 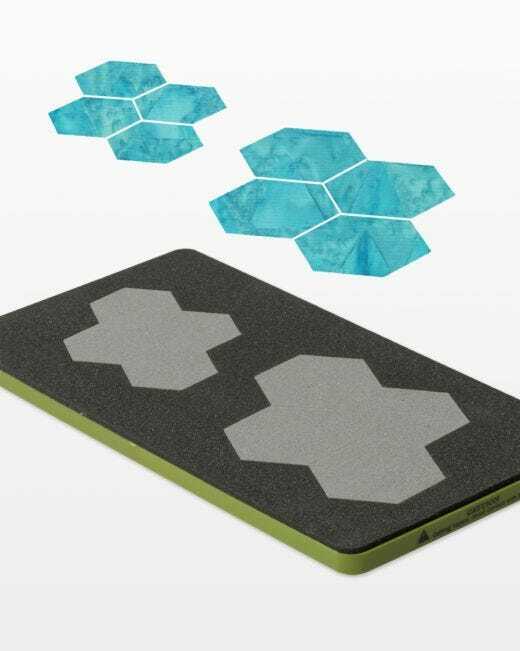 What a pretty hexagon piece. Your little birdie is super cute, too. Thank you, Bea, for joining the B&W hop. Such a unique post to read. 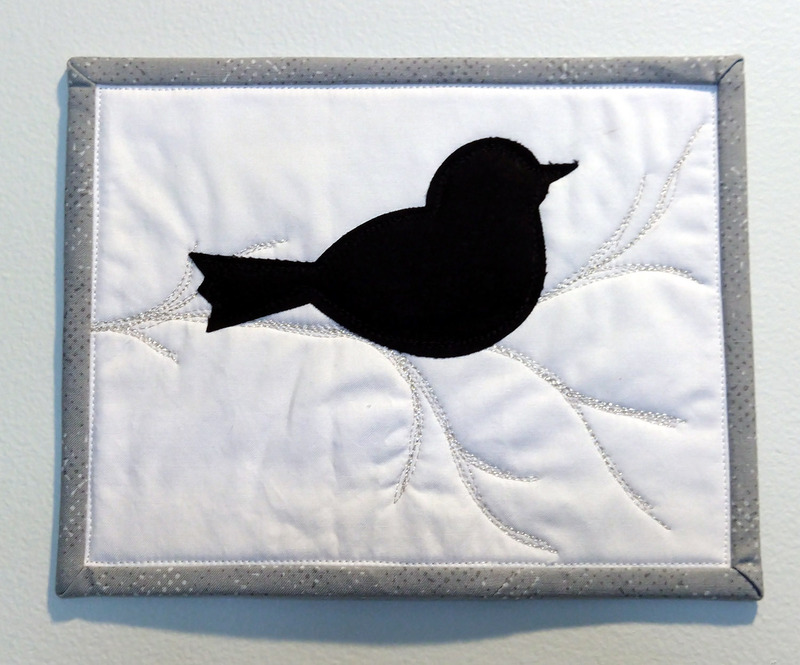 That little bird is so cute and using the silver thread was a great idea. The hexagons look really pretty in black and white! Your black and white hexies look so nice and that little bird is so sweet. 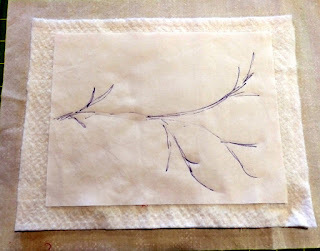 I love the idea of using the metallic threads for the branch. Both projects are great. Nicely done. Love the quilting on your hexie quilt. I don't have the patience for hand stitching myself, so it's nice to admire it from afar! LOL!! That little birdie is just too cute. Nice to know that the metallics run thru the long arm nicely. 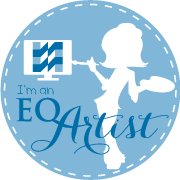 I love using them in my domestic machine for free motion quilting. Both projects are so cute, Bea. I haven't tried EPP but this may be the year to start! You always come up with cute stuff! 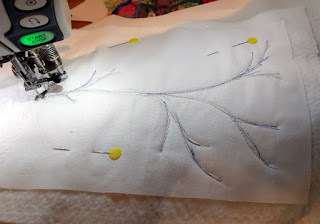 Your line quilting is so perfect. 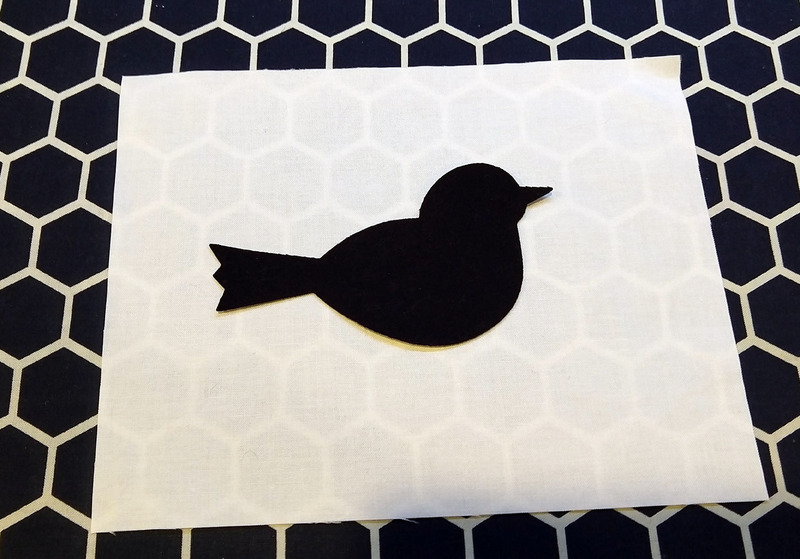 Nice projects - I especially like your little bird! Ah, I just finished a hexagon quilt top in low volume plaids. Waiting for the UFO Challenge hop to post the linkup at month's end. Love your little quilt and your little birdie! 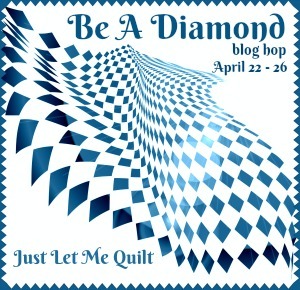 Congrats in completing not one, but TWO projects for the Black and White Blog Hop!! I really like both of your projects but have to admit to liking the bird the best. Just something about it really speaks to me....maybe because I love birds? ;) Thanks so much for sharing. We are California’s 24/7 Traveling Notary Service. We value your time! 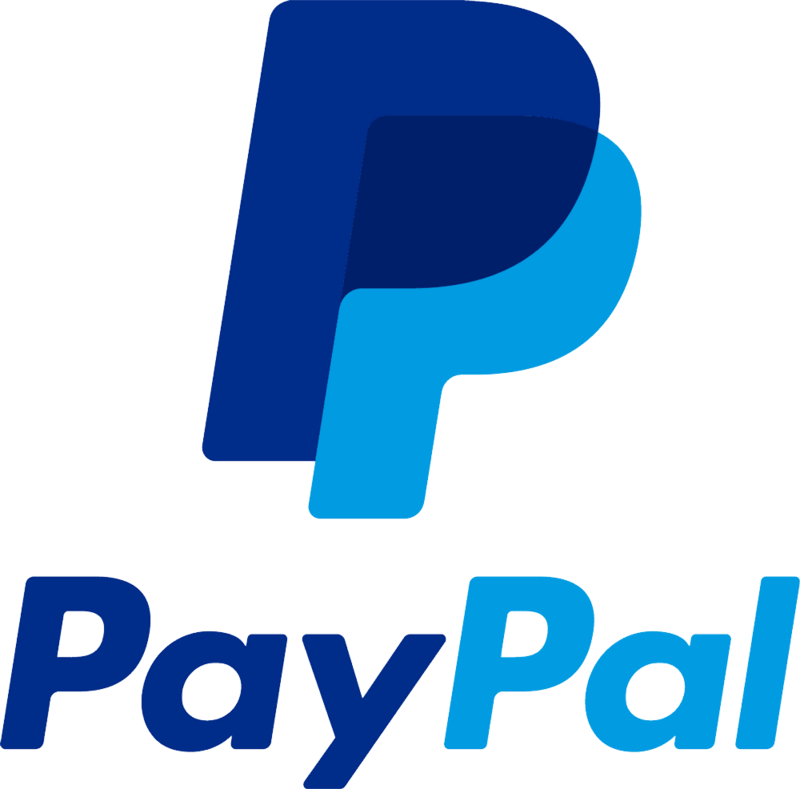 Let us save you money, gas and frustration by Traveling to you. You will see why we are the #1 Notary Service in California. Just lovely! You're also ahead of the next hop for something with wings!! Well done! Very cute projects, Bea! Thanks for sharing! A lovely hexagon quilt, and that little birdie is soooo cute. Wow, I absolutely love that little bird!!!! The stitched branch is genius. Beautiful! I do love your Hexies but I'm swooning over the bird on the branch. So sweet. 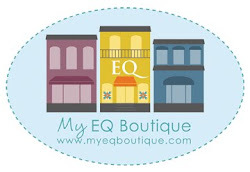 Great mini quilts!!! I especially love how you used the metallic thread for the branch! AWESOME!!! 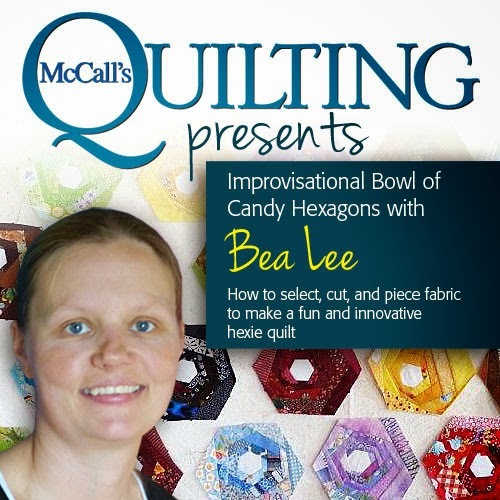 Bea, I love your EPP project. I have yet to give one a try. Everyone who posts an EpP project does a super job and I am encouraged by each one. They all look fantastic. I don't know if there are those who don't do well and just don't post them, or not? I love the bird and your creativity on the branches. I had never heard the rules of thumb about placement for an object. That's great to know. I love that the bird is checking the temperature over the children. My "baby" was just home for the first time in 2 1/2 years and I could have used a bird to check on her. It was a short visit and nice to see her. She took Friday off from teaching and then had Monday off, so it was a very short trip. She thought she needed to come check on Mom. Thanks for sharing all your cute projects. 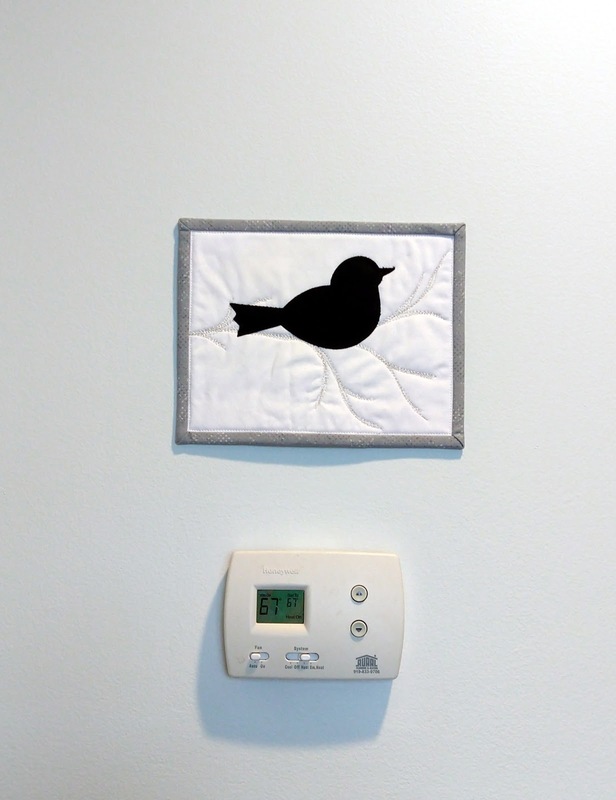 You may have nudged me closer to buying a die cutter...and that birdie is ADORABLE and looks happy in its new home on the wall guarding the thermostat. Love both projects Bea, but especially the birdie ..... he’s so cute! Seeing those hexies and finding out there is a cutter. I am putting that on my wish list to go with my Go! Cutter, thanks for sharing your lovely projects! Great projects! I love the thread art with the birdie. Sweet. Thanks for sharing! I like your work. The vision turned into a bird on a branch is great. I have used metallic thread. Following suggestions on making it successful helped. I like that B & W hexy quilt. pretty. I love black and white quilts! 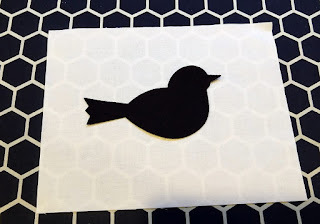 Your Hexie piece is sweet and your bird is awesome! Great work! Thanks for being a hop stop. 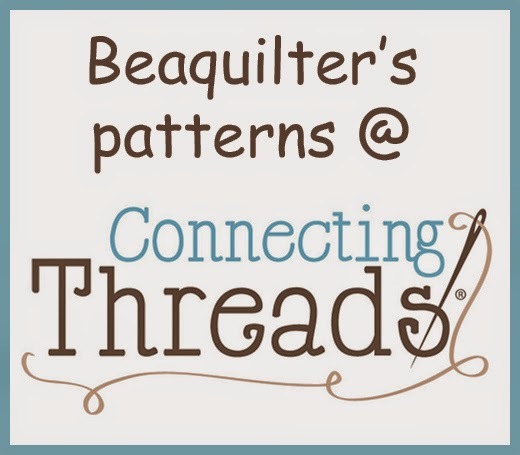 Bea, your projects are gorgeous! 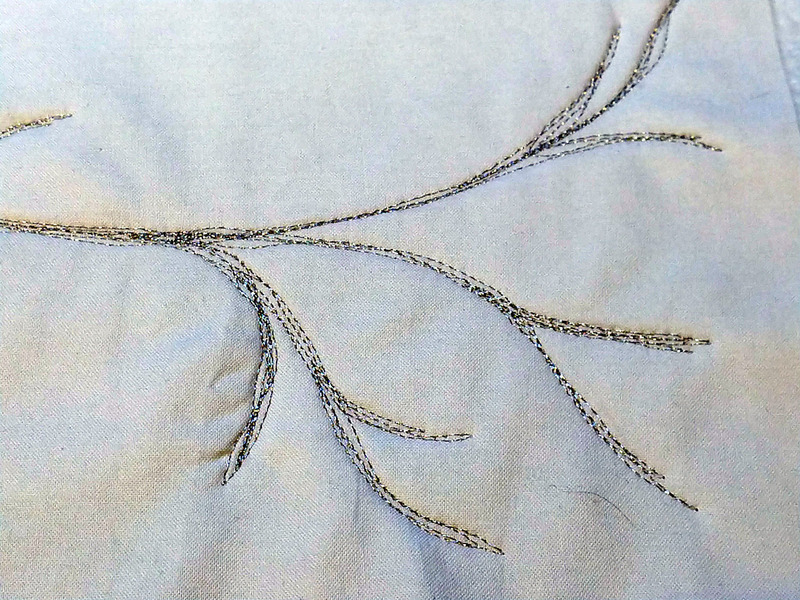 I like the bird's branch stitched out in metallic thread. 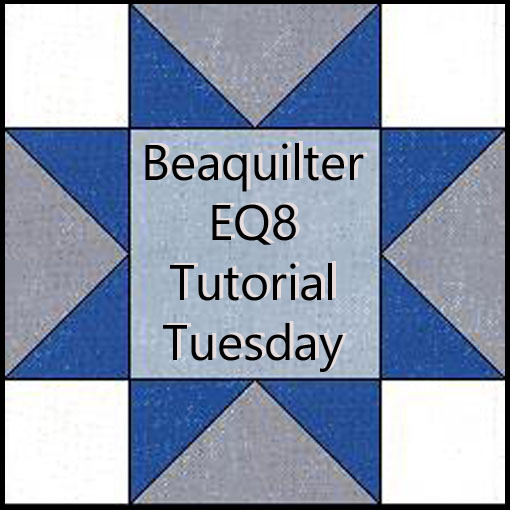 AccuQuilt dies are the best. I hadn't seen the new hexagon die, but wow, what a time saver to be able to cut out multiples of both the foundations and the fabrics. I love both projects Bea. I'll never have the patience to do an EPP project, but I really love them. Perhaps one day someone will gift me one. :) The bird on the branch with the new thread is also lovely. I do wish I could see the metallic thread a little bit more, but the branches are obvious also. Love both of your projects! I've also been dying to try that metallic thread, but my previous experience with metallic thread made me say some naughty words out of frustration when the thread kept shredding and breaking every few inches. Perhaps next time will be better. . .
Love the little birdie! So cute! Love both of your projects. Octagons and birds are some of my favorites. The little bird on a branch is so sweet.